I met a man last winter in a coffee shop. He wore glasses, smiled incessantly, and made me feel edgy. It turned out the shop was his. Then it turned out we married five months later. And that’s how I married coffee. Until I met my husband, Matt, I thought (like so many of us misguided cooks & food enthusiasts do) that I knew good coffee. I was wrong. Completely wrong. I thought to get an espresso standing at a bar in Italy was to appreciate good coffee, but the truth is, that’s an appreciation of good narrative, not coffee. That’s not to condemn Italian coffee, by all means the Italians know their espresso. But an ability to pull an espresso cannot make up for poor quality beans or a poor quality roast, both of which are globally rampant. In the end, brewing method is a matter of preference, but beans are a matter of quality. Beans are actually a fruit, a vibrant red cherry that grows high up in the mountains. There are varietals with nuances just like the nuances of different types of wine grapes. In wine grapes you have your pinot noir, merlot, and cabernet, and in coffee beans you have your catuai, pacamara, and geisha. And so many more. Each variety possesses it’s own flavor profile, and how the seeds are processed (there are washed beans, natural processed beans, and “honey” processed beans) can also have a profound effect on the final taste. The roasting contributes yet another layer to coaxing the natural flavor & sweetness of the coffee beans. You won’t find many “dark” roasts in specialty coffee, because for people passionate about the coffee bean’s integrity, ordering a dark roast coffee is akin to a French patisserie and asking for a burnt croissant. I’ve learned is that it’s a combination of region, farm, varietal, process, roast, and brewing method that have to be considered in order to produce great coffee. 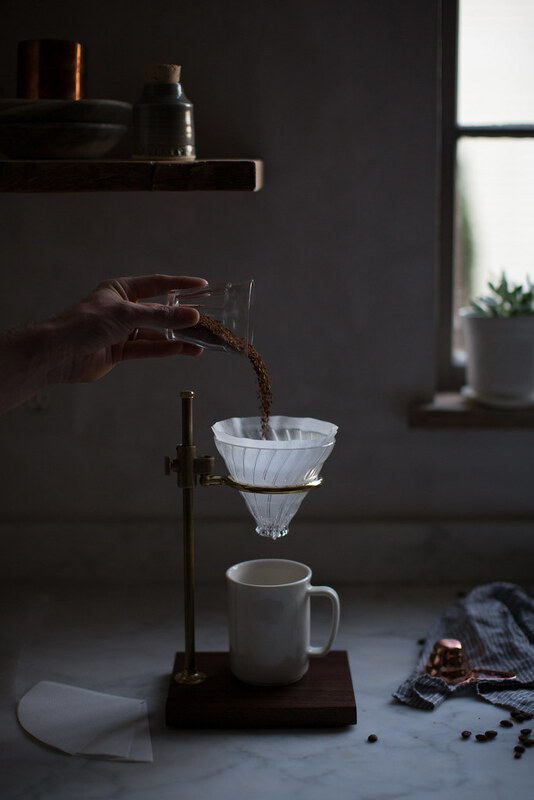 As the founder, owner, importer, roaster, and champion barista behind Brash Coffee, my husband works through all these elements before pouring every cup. He travels to the farms himself and tastes the crop, sampling the different varietals (which, like wine, differ from year to year) from Ecuador to El Salvador, Panama to Honduras. After back room cuppings far off the beaten path, he selects the best beans. When they arrive, he roasts them himself. At present there still isn’t anyone else he trusts to do his roasting. It’s that particular; roasting is an art unto itself. And so is brewing. That final step needs to be done with care in order to get the most out of the beans: the most sweetness, the most complexity, the best flavor. 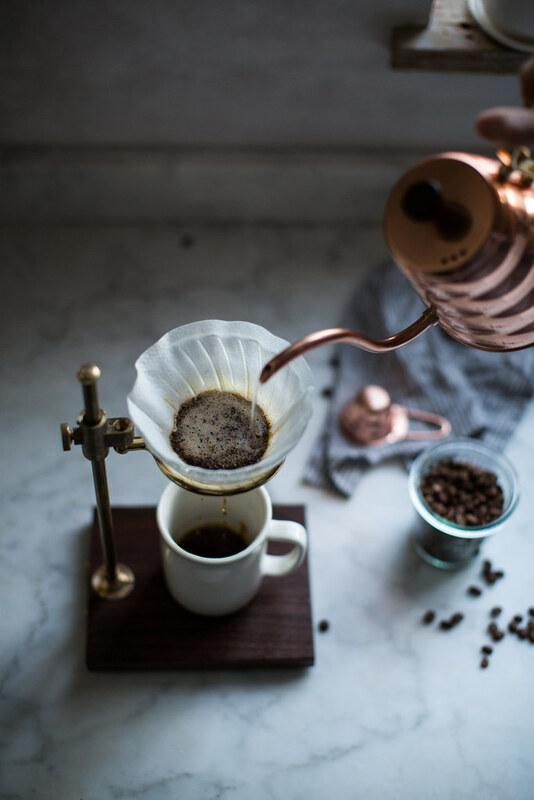 So whether you prefer French Press or the classic Pour Over (my personal favorite for it’s clean, bright taste), we’ve written a step by step guide for your home brewing. And by we, I mean my husband told me what to do and I wrote it down. The truth is, I still rarely if ever make my own coffee…spoiled, I know. 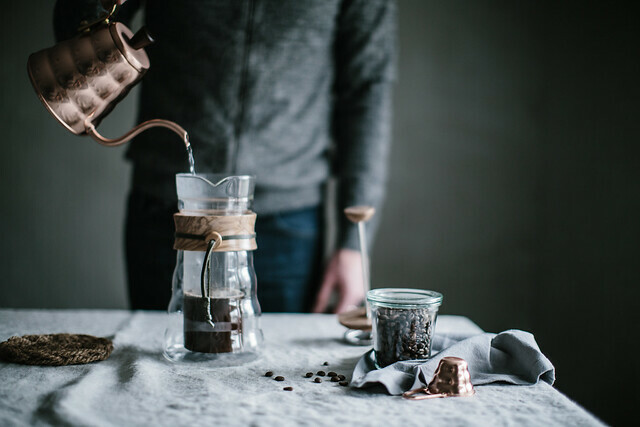 You can find this gorgeous brass & walnut pour over, olive wood French press, copper kettle & coffee scoop, and so much more handsome gear for home brewing over at my partner Kaufmann Mercantile. 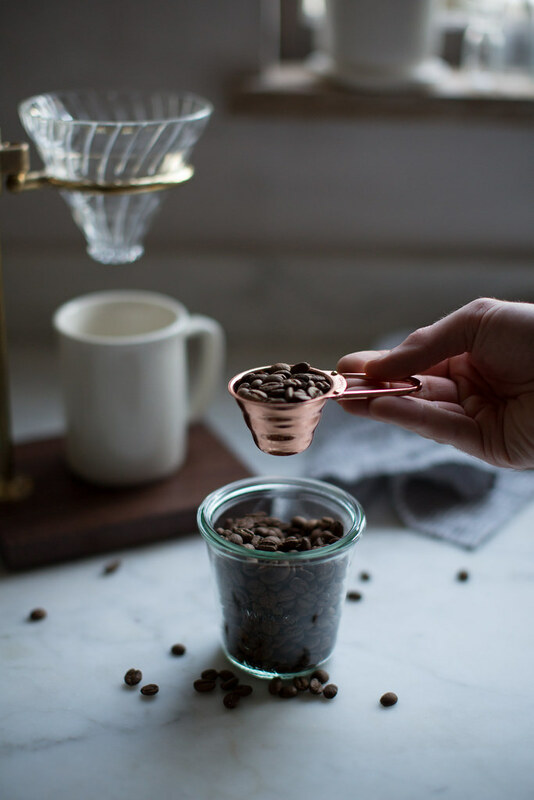 And you can find one additional guide not included here, our guide to Stovetop Espresso, on their blog Field Notes! 2. Weigh out 15 grams of coffee on your digital scale. 3. 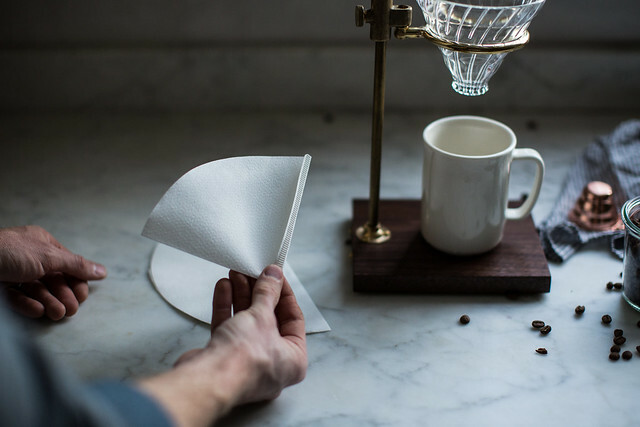 Fold the v60 paper filter on its crease so that it fits flush inside the brewer, then place the filter inside the brewer. 4. 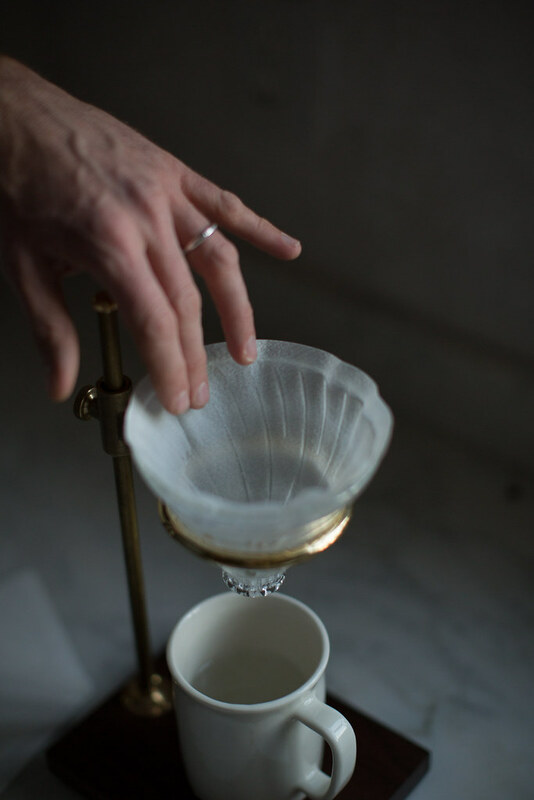 Pour some hot filtered water over the filter to rinse paper flavor from the filter and preheat the brewer. 5. Grind the coffee on a medium fine setting, it should be the consistency of table salt. 6. Pour the coffee into the rinsed, damp filter. 7. Make sure the filtered water is at the right temperature to brew, it should be between 195-205 degrees. If you do not have a digital thermometer, simply wait a few minutes after it stops boiling. 8. Weigh out 240 ml of water from your kettle. 9. Pour the water over the top of the grounds in slow, concentric circles until the grinds are fully saturated. Then wait 30-45 seconds before pouring about half of the remaining water over the coffee slowly and in concentric circles. 10. Wait as the water drips through for a few seconds, then continue this process of pouring and waiting until all the water is used. 11. Once the dripping from the cone has slowed to a stop, enjoy your coffee. 1. Fill kettle with filtered water and bring to a boil or using a digital thermometer bring to 195-205 degrees. 2. Weigh out 33 grams of coffee on your digital scale. 3. Grind the coffee to a medium coarse consistency. 4. Preheat the French Press by filling it with hot filtered water, waiting for about a minute, then pouring the water out. 5. Place the ground coffee into the base of the French Press. 6. Make sure the filtered water is at the right temperature to brew, it should be between 195-205 degrees. If you do not have a thermometer, just wait a few minutes after it stops boiling. 7. Pour 550 ml of hot water over the top of the coffee grounds. 8. 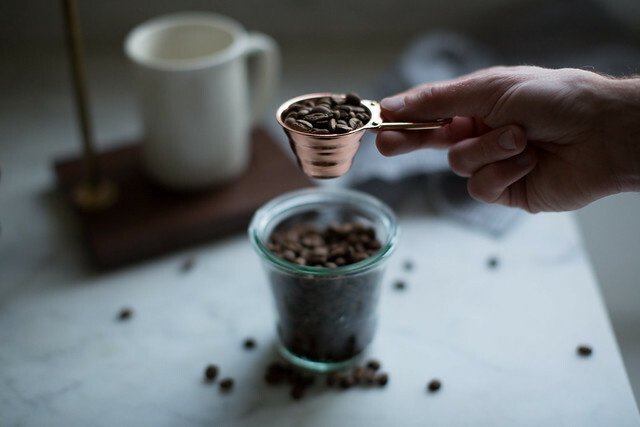 Using the French Press plunger, plunge the wet coffee grain bed several times to agitate the coffee grinds,swirling them around in the water. Make sure to leave the coffee grinds submerged under the surface of the water. 9. Allow the grinds to steep for approximately 3 to 4 minutes. 10. 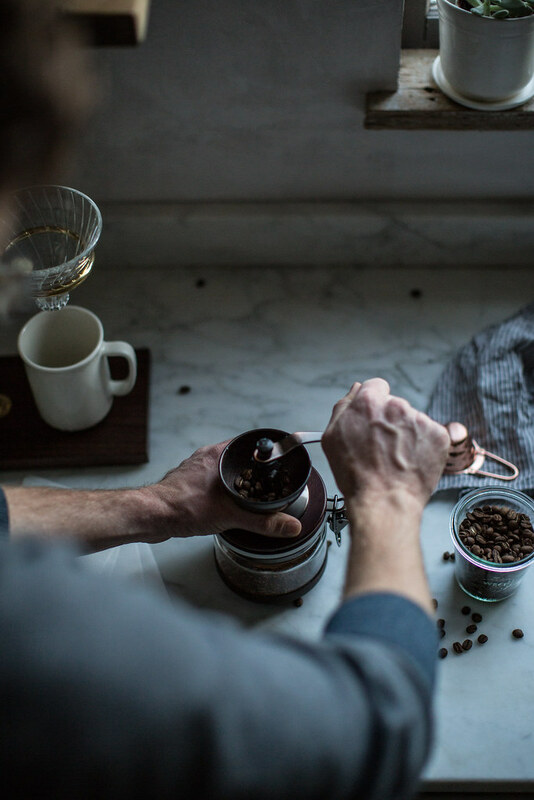 Plunge the grinds to the bottom of the press, pour into your favorite mug, and enjoy. I always loved the process of making coffee in the morning. I’m an early riser and it’s particularly lovely during the blue-hour before the city (for me, London) wakes up. I gave up coffee for a few months because I was too dependent on it, but going to ease myself into it again after the new year (so I have only one cup a day…eesh startup life). Looking forward to re-reading this post again soon once I’m back into routine! Hi Supal. Stick with it hun. 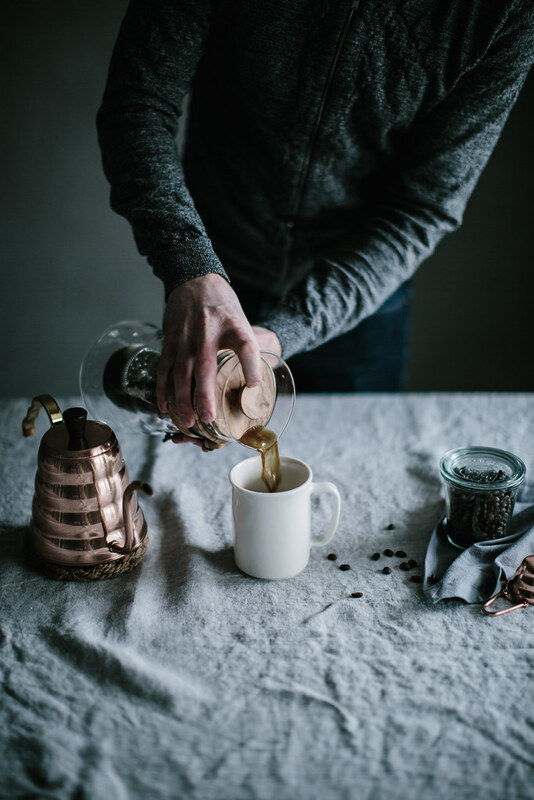 I did that 10 years ago, and the biggest change for me, is I absolutely look forward to my one cup of, beautifully made, strong coffee each and every morning. I savour it, a real treat, no longer taken for granted. As caffeine has always been my body’s nemesis (two cups of black tea and I’m basically passing out), coffee has been something I’ve had to avoid. 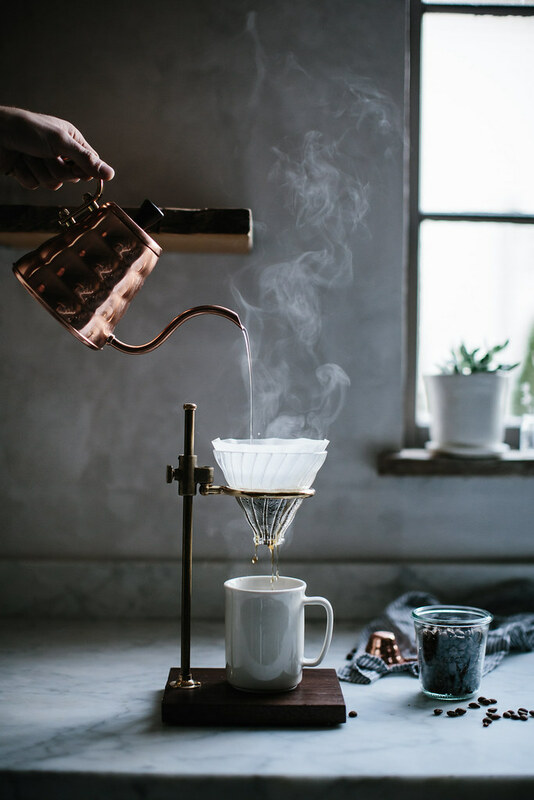 Now recently married myself to someone who enjoys coffee, I’ve been longing to learn how to make quality coffee for him — hoping that you’d post a tutorial like this! Thank you so much. 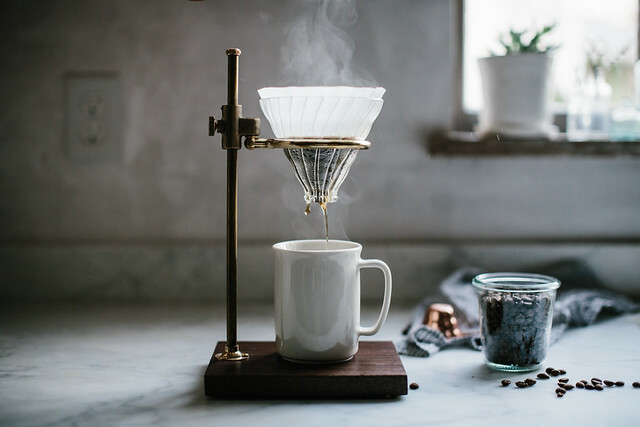 For someone who has never brewed a cup in her life, but doesn’t want to start out poorly, this is so helpful. Lovely article, a rather necessary one. You mention that it never turns out as you would love it. Is it that you get more bitterness and less flavor notes? Love this post! 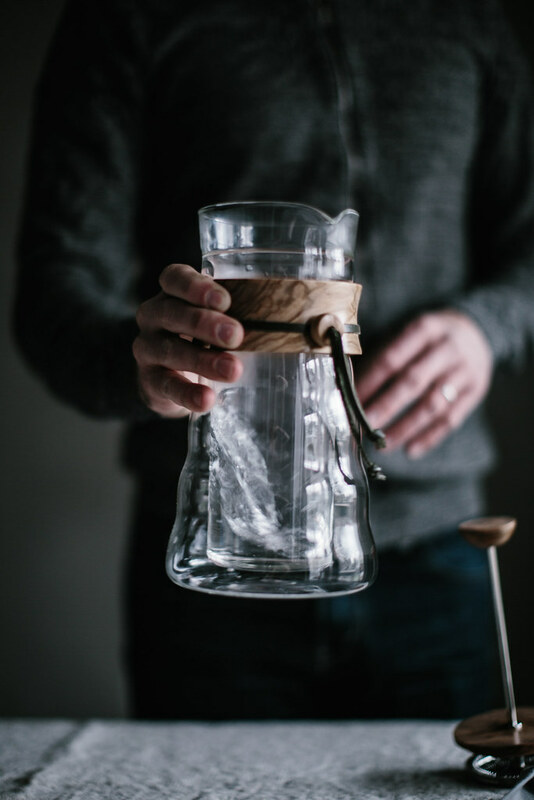 How much coffee and water would your husband recommend for a Chemex? Is it the same as the V60? I really like the French press method just because it uses less materials. For beans, I prefer darker roasts as I really enjoy the roasty flavors in my hot coffee. But it’s the opposite case when I drink cold brew coffee. I was looking at your French press method, and I was wondering if that it is meant for 1 or 2 servings (or cups) of coffee? wow! amazing way to have a hot, dark and fresh coffee in this winter. I’m getting there with coffee – I’m not really sure what kinds I like, but when I try different coffees I nearly always enjoy them. I started grinding my own beans the other week for the first time and the difference from pre-ground was instantly noticeable! Generally I don’t make time for coffee, I saw it as the quick alternative to making a cup of tea. I’ve now realised I need to take more time over my drinks, we’ve just got a new puppy and I’m up SO much earlier now than I used to be. So coffee has become not only a necessity, but something I can now take the time over. Thank you so much for the measurements, I never have any idea how much coffee beans to grind! I actually do not like coffee. Portugal is surely famous – did you get to drink espresso here, when you came over? – for burning coffee on the espresso machine on top of using bad quality beans, so all my life I have kind of detested coffee, unless I drown it in milk. But i do the same with tea, so sometimes I think the problem is actually me, I must love milk way too much if I drown everyhting in it. Still, I owned an espresso machine for many many years and I hated what came out of it. When I substituted the espresso machine with a drip coffee maker, I realised I started enjoying coffee a little bit more, it tasted better and never so bitter and burnt. I won’t go back to espressos but I am not yet there where I can say I love the taste of coffee – I’m at the pint I don’t have to drown it in my milk to enjoy the taste of it! ¡Gracias! … for all the time information you shared. My family had a small coffee “farm” in Utuado, Puerto Rico and as a result I grew up enjoying fresh picked, roasted and ground coffee … ¡Riquísimo! These pictures made me wanna try that coffee so bad! I’ve been experimenting with all sorts of coffee makers, drippers, techniques, etc. I really have to try this out! What grinder do you recommend? I think this is the one in the photo? Pingback: Breakfast – Mira que guayón! This is a really helpful and nice article. 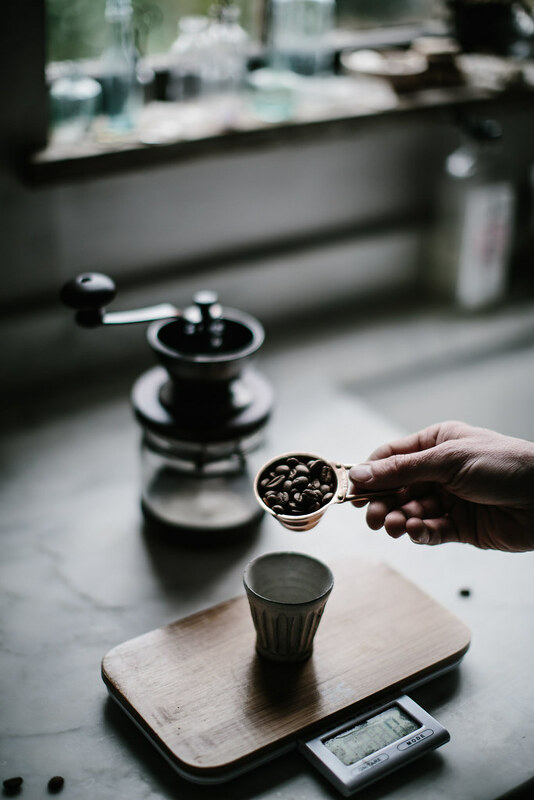 I love the photographs too, they brings out the beauty of french press. What about Ethiopia?? The best coffee in the world. The birthplace of coffee if you will… I have been four times to the highlands in the southern region where coffe is grown. Please visit!!! Oh I love anything wood and brass! Love your story and your passion! What’s the best way to roast at home? I don’t really think there is a good way to roast at home unless you are a professional roaster like my husband. That said, I can’t remember the name of the machine he uses but I’ll ask him! I love the look of it! Very nostalgic. I love how versatile it is. Our family all likes different coffee drinks. I would love this for my mom especially, she loves coffee. Thanks for the chance & good luck everyone!! We forget how much work and don’t appreciate the coffee beans and great taste. By adding water and pushing the on the button for our cheap coffee, every morning.